Alex Ekwueme Federal Univesity, Ndufu-Alike Ikwo, Abakaliki, Ebonyi State, AE-FUNAI Notice to Graduands on the Hiring/Purchase of Academic Gowns, Collection of Certificates and Other Materials for the 3rd Convocation Ceremony. All Graduating students of the Alex Ekwueme Federal Univesity, Ndufu-Alike Ikwo, Abakaliki, Ebonyi State, AE-FUNAI are to take note of this for the purpose of Hiring/Purchase of Academic Gowns, Collection of Certificates and Other Materials for the 3rd Convocation Ceremony. See Also: FUNAI 3rd Convocation Ceremony Programme of Events and FUNAI List of Graduating Students for 2017/2018 | PDF Download. 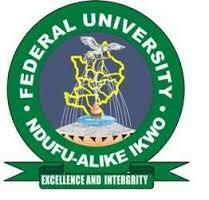 FUNAI 3rd Convocation: Hiring of Gowns, Collection of Certificates and Other Materials Notice to Graduating Students. All hired gowns should be returned to the collection points not later than Wednesday, 19th December, 2018. Failure to return the gown on time shall attract a fine of N1, 500 daily while damage or outright loss of the gown shall attract a penalty of N20, 000. All graduands are to assemble in front of the G. O. Chukwu Block by 10: 00 am for commencement of procession. It is compulsory for all grauands to participate in the academic procession and to put on the approved academic regalia. Note: All payments should be made through remita to Alex Ekwueme Federal University Ndufu-Alike.